"But the look like big pink wi..."
Uh, yeah, and there is a similar one called the mutinus caninus or dog stinkhorn. This was definitely something to grab the camera for. Interesting for sure. 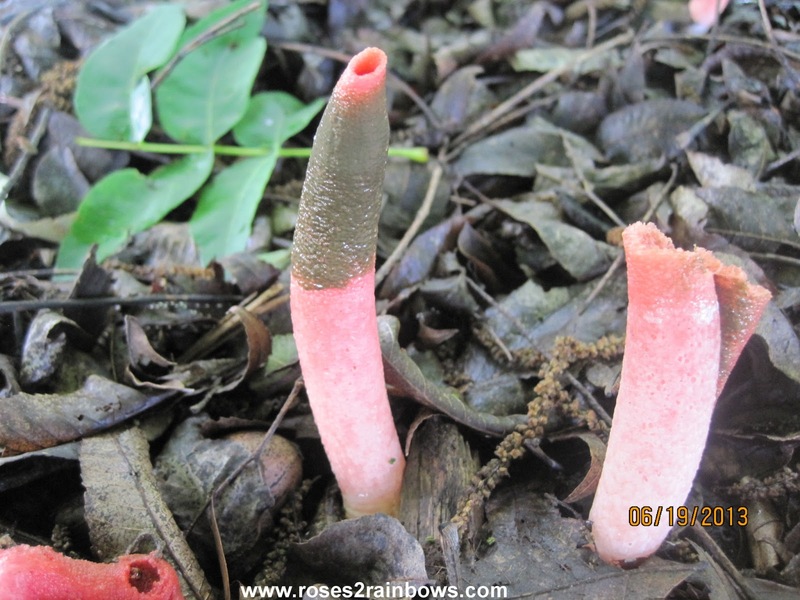 Fungi can be so weird. I have seen those in the Kansas City area as well. Last year was the first year, I have ever had them in my flower bed. Strange looking for sure. Hi Linda .. what fascinating looking fungi ... I bet they stink if they're knocked over or damaged .. Interesting about the research being done - so many plants offer us so much ..
Whoa. I've never seen those before either! Nicky- I guess that means I shouldn't harvest the spores, huh? Hilary- I like finding unusual treats in nature. Cheryl- Once you have some, my guess is that you'll have more. I've found them on several more days in the same area. Hilary- You're welcome. I still don't smell anything and several were knocked over or distintigrated. Strange. Michael was shooting his water gun into some mulch and puffs of dark spores shot into the air. Kevin said it was a fungus too. Weird stuff. Love your pictures. Ashley- Thanks for stopping by. They are strange looking. I think I've had those spore-emitting puffy things in my yard. Always "fun" to hit them with the lawnmower. 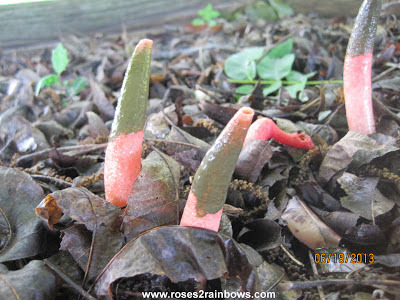 They look muddy fingers to me:~) Such a cool thing to find! I have had these near my railroad tie flower bed. I live in Wisconsin. They attract fly's like crazy and they smell horrible. I found them after 3 or 4 days of cloudy weather. But as soon as the sun can out they withered down to nothing but the fly's still hung around. Sara - Don't know how I missed this. They were interesting and very cool. Mike Schabow- Thank you for dropping by and for reading and commenting on this older post. Oddly, the ones in my yard didn't smell. Maybe they did after they deteriorated, but I didn't get close to them after I took the pictures. Just found a bunch in my garden, i was freaked out, not knowing whether they were poisonous, but also because they're so weird looking. Can it be used for antibiotic purposes? While they have antibiotic properties, I suspect just using the fungus as is probably wouldn't do anything helpful and could be hazardous. I found some of these in my yard today...very near a dogwood tree. I broke one off to see what on earth it was, and the odor is awful! They looked like devil's horns coming up out of the ground. Bizarre! I didn't open one to see if it smelled so I'll take your word for it. Strangely, I have not seen any more anywhere, and it's been four years.